I have a three to four cup a day coffee habit, not uncommon among those of us who spend most of the workday at a desk, pecking at a keyboard for a living. Americans consume the equivalent of 500 cups per person - per year and import half of the worlds coffee crop. Caffeine is the world's most widely used central nervous system stimulant, with approximately 80% consumed in the form of coffee. Coffee's reputation as America's favorite bad habit has been redeemed with Many recent reports in scientific literature pointing out many benefits of regular coffee consumption. These health benefits include statistically lower rates of stroke, 1612 diabetes, 1447 prostate cancer, 1446, and depression among caffeinated coffee drinkers when compared to non-coffee drinkers. The welcome surge of alertness and energy that the morning cup of coffee aids our start to the work day. Caffeine and caffeinated coffee have been shown to improve short-term alertness, attention, and memory, and may have long term protective benefits on cognitive decline as well. 1733 Many studies confirm the common knowledge that aspirin or other analgesics provide work faster and better on headaches when combined with caffeine. 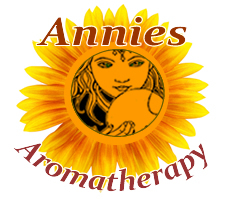 The caffeine in coffee and tea is a chemical cousin to the asthma drug theophylline, drinking coffee and caffeinated teas can help calm an asthma attack and stop coughing spasms. White,Linda B., M.D. As in all things balance is key, coffee's worst aspect may be that it crowds out the many other healthy herbal teas and drinks we should be consuming during the course of the day. Not all coffee studies have produced positive results and dosage may be a key factor, along with coffee chemotype, processing, and preparation. The dosage most frequently associated with decreased risk is one to three cups/day or approximately 350 mg caffeine/day. However, several studies have reported increased mortality associated with consumption of = four cups/day. Individual variables may also influence the effects of coffee and caffeine. Preparation Methods & Dosage :Coffee can be prepared by boiling, drip brew, and French press, the favorite method of coffee aficionados. Make the most of your coffee by brewing it fresh from good quality, fair trade, beans. Good coffee doesn't require copious amounts of cream and sugar to make it palatable. Coffee Side Effects: Nursing mothers who drink coffee might transfer the caffeine to their babies, giving them insomnia. Don't take mineral supplements with your morning cup of coffee as it may impede your body's absorption of calcium, magnesium, iron and other nutrients. Coffea arabica, the first cultivated species of coffee is native to northeastern Africa. 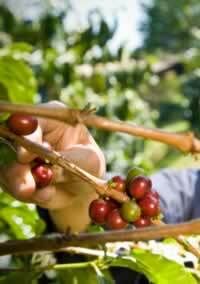 Coffee plants are evergreen shrubs with glossy leaves up to 10 in long. It produces dense clusters of fragrant white flowers in late summer. Ripe red fruits contain 2 seeds (coffee beans). 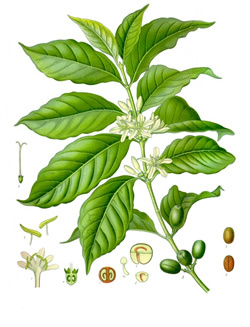 Coffea arabica, the first cultivated species of coffee is native to northeastern Africa. Coffee plants are evergreen shrubs with glossy leaves up to 10 in long. It produced dense clusters of fragrant white flowers in late summer. Ripe red fruits contain 2 seeds (coffee beans). Some have had success growing coffee in greenhouses, or as houseplants in less temperate climates. Used coffee grounds make great plant food for acid loving plants like tomatoes. Use 1 part grounds to 3 parts cool water and pour it on your plants roots weekly. Originally from Ethiopia, coffee was cultivated in various parts of the middle east in the fifteenth century and spread to Europe in the 17th century. For a long time Arab lands controlled the plant and seeds, with most of the supply being shipped through the port of Mocha. In the late 1600's enterprising Dutch traders smuggled out some seeds and cultivated them on the island of Java. White, Linda B. M.D.. "The Herbal Drugstore" Rodale, (2003) The caffeine in coffee and tea is a chemical cousin to the asthma drug theophylline. Researchers have found that a caffeine dose of 7 milligrams per 2.2 pounds of body weight can significantly improve lung function of people with asthma.